Illinois is historically known for being the birthplace of Abraham Lincoln, one of the most well known American presidents. Illinois has one of the main cities of the United States – Chicago, a major financial hub as well as art epicenter. Manufacturing, agriculture, and tourism are other major economic drivers of the state. Overall, Illinois produces $772 billion of product as of 2015. Despite what is heard in the news about Chicago crime, the state overall has a wide selection of cities to live in with high safety ratings. Of the top 25 safest cities in the state, 18 of them have a safety rating of 80 or higher. Chicago itself has some areas with a high amount of crime, but they are concentrated. As a whole, Chicago has a safety rating of 72. 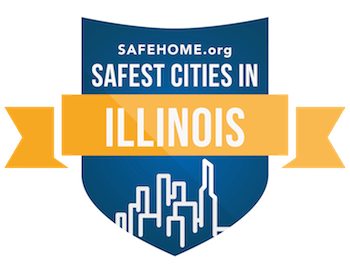 On the national level, Illinois has 11 of the top 100 safest cities, and Chicago even makes it into the top 500 safest cities in the nation. With a population of 2.7 million, that is quite an impressive feat. The safest city in the state is Wheaton, with a safety rating of 90.43 and a population of 53,800. It has seen a 17.8% drop in violent crime. It is due west of Chicago, and has a family median income of $113,517. As with most of the other safest cities in other states, the high income level is indicative of the safety rating, as there is a much lower propensity for crime in areas where everyone is financially stable. As for other areas, the northwest suburbs of Chicago have the highest concentration of cities with high safety ratings. Hoffman Estates (90.16), Palatine (90.17), Arlington Heights (89.96), and Mount Prospect (89.49) are all within commuting distance to Chicago from the northwest. Despite the bad rep Chicago may get for a crime, keep in mind that crime is mostly concentrated to very small sections of an expansive city, and there are many safe areas to live in nearby.